It's official! We have a preschool graduate in the house! 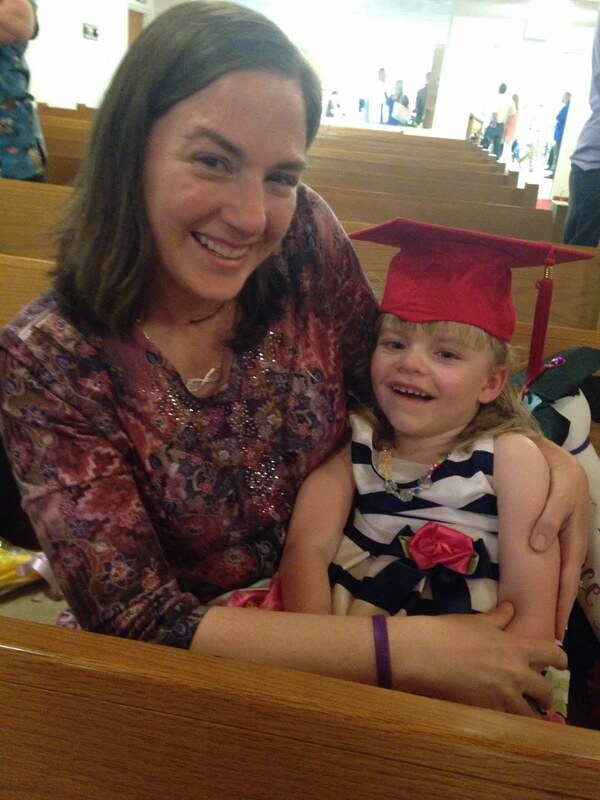 After spending three years in our church's preschool program, Grace will officially move into kindergarten this fall. And as she moves into the next stage of her schooling, we feel very blessed for the experiences she had in preschool. The graduate led the processional of her classmates. Grace really enjoyed the music in the program. Just before her third birthday, Grace had her very first day of preschool at our church. Although we met with the school district's pre-kindergarten program, we felt like the church's program three mornings a week would be a better fit for Grace. That way we could still take her to physical therapy in Springfield on Fridays. 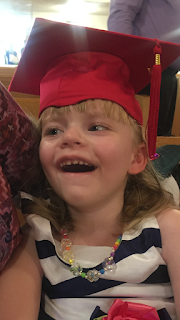 Our little preschool graduate was all smiles. All of Grace's classmates in the morning and afternoon classes signed a graduation puppy for her. Grace had two different aides (Carla Bolton and Alex Carter) during her three years at the church, and we are so grateful to both of them for working hard include Grace in as many activities as possible. 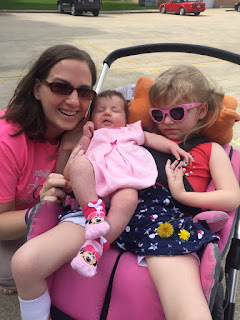 They helped her to create masterpiece paintings and art projects, read stories to her and just generally loved on her the entire time she was there. Grace and all her preschool friends. Grace and her proud preschool teachers. One of the biggest highlights over the past three years has been the other students. It seemed like every morning we arrived late to school, but some of her friends were always waiting to greet her, genuinely excited she was there to share in their day. 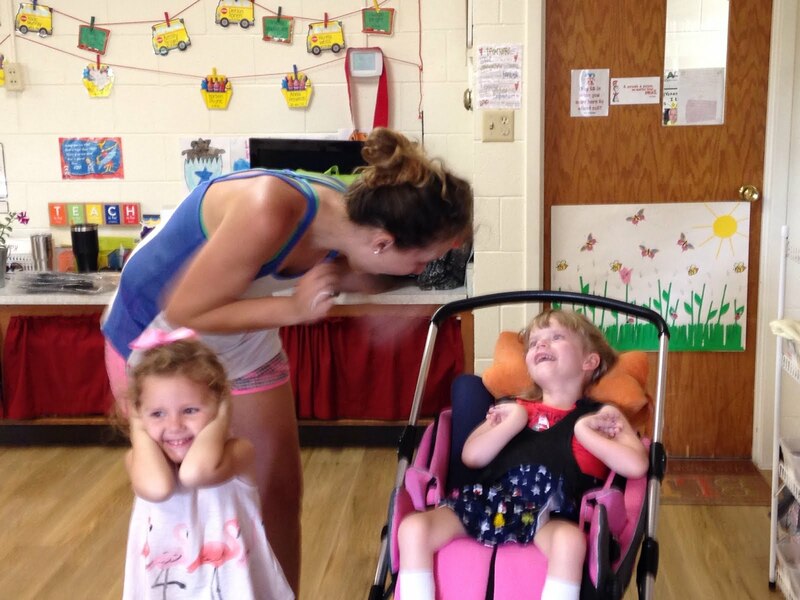 During free play time, they held puppet shows for her, played house with her and just really looked out for her. Mark my words, those kids are going to be the real heroes of the world someday for their kindness and compassion. 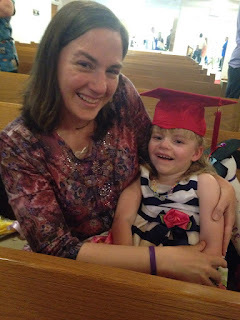 Mommy and her favorite preschool graduate. Grace and her proud grandparents. 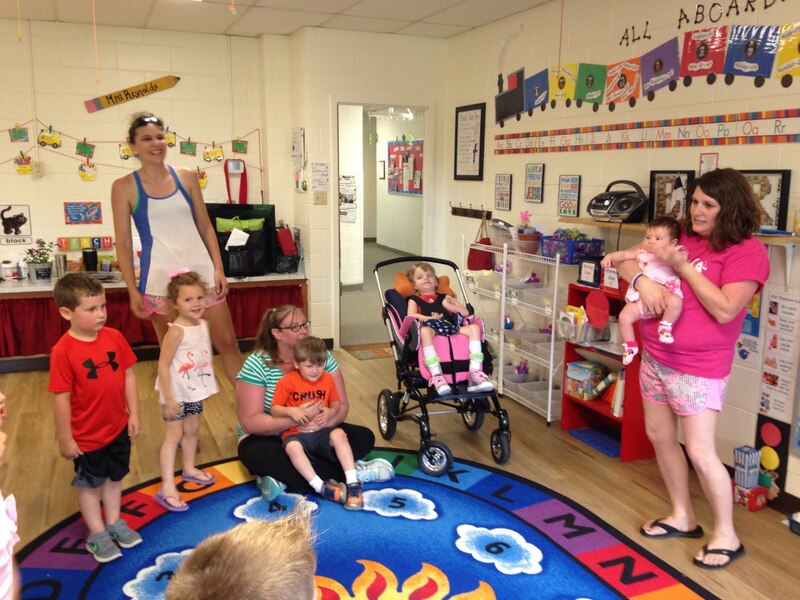 All of our adventures came to a culmination this week at Grace's Movin' Up program. When I dropped Grace off at school that morning, her teachers told me they had some surprises in store, and I told them I would probably cry. Grace looked just beautiful in her Easter dress, with a necklace and bracelet as accessories. We dropped her off in her classroom and made our way to the sanctuary to find our seats. Both sets of our parents were already there, so we joined them. Grace on her very last day of preschool. Kyle and I both had a little trouble before the program started. For me, it's hard not to wonder what type of personality Grace would have if INAD hadn't stolen so much from her. Would she be the kid singing loudly and dancing around the front of the church? Or would she be the quieter one, more reserved, even though she knew all the words by heart? It's a little bittersweet, not ever having heard Grace sing Jesus Loves Me with all her friends. Charlotte and I joined Grace on her last day of preschool. So as the program got ready to start, I felt my eyes fill with tears of sadness for all the things I felt like i had missed out on over the years. But as the kids began to file in, our friend, Mindy, carried Grace up the aisle in her graduation cap, and I beamed with pride for how far Grace has come. Grace's friend Lauren blew bubbles for her. Throughout the program, I kept my eyes focused on Grace. Even though she got hot and sweaty in the church, you could tell she enjoyed being a part of the program. She smiled during some of her favorite songs, and even though I still wish she could sing the songs, I also know she's a very big part of the program in her own way. Charlotte helped lead the final songs at circle time. 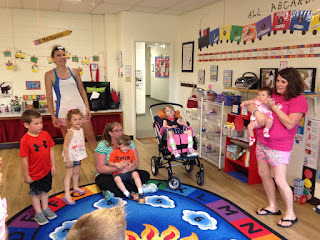 When it came time to recognize the kids, they presented Grace with her preschool graduation certificate and a graduation puppy that all the kids and teachers had signed. I think her teachers were just about as emotional as we were. I'm so grateful for the love and support they have shown to Grace over the past three years. Grace has always loved music time! After the program was over, Grandma Susie gave Grace and her cousin, Isabel, flowers and a balloon for doing so great. We also had lots of time for photos before leaving one last time. Later that night, Grace's aide texted me and asked if Charlotte and I wanted to spend the last day of preschool with Grace, and we happily agreed. It was a beautiful day, and the teachers had set up stations outside. 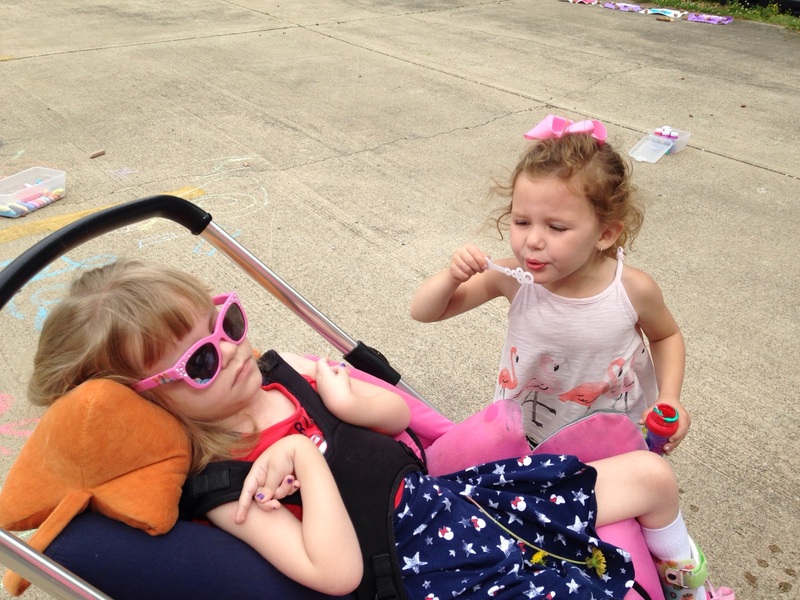 Grace loved the wind in her face, and her friend, Lauren, even blew bubbles for her. Then Grace and I shared some ice cream on her very last day. 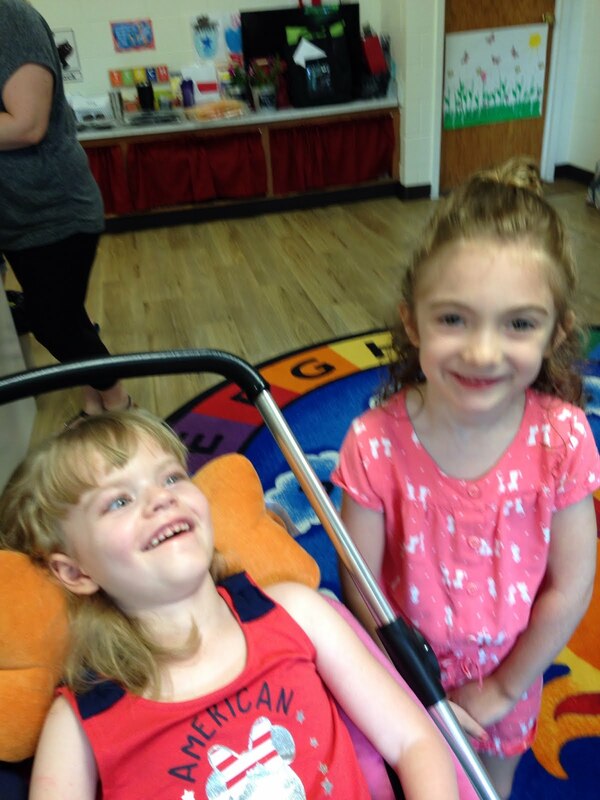 Grace's friend Dahlia came to visit on her last day of preschool. 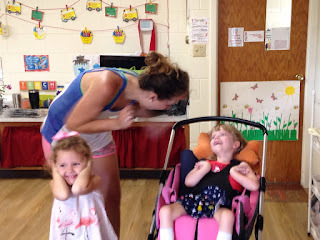 There were lots of hugs, and maybe a few tears as we packed up to leave, but we will always have the memories (and lots of photos) from Grace's preschool experience. It means so much to us that neither the teachers nor the students treated Grace any differently than they would any of the other students. Final family photo at preschool. 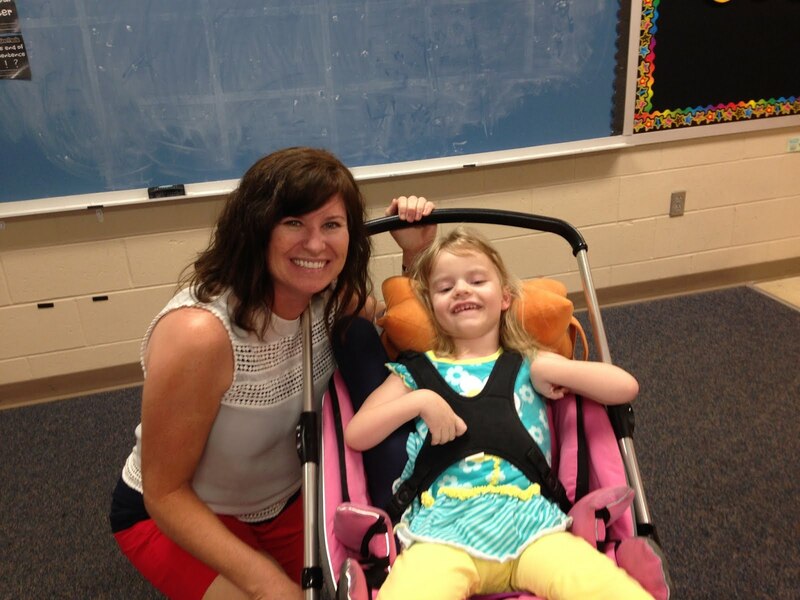 Before the week ended, we had a meeting with Grace's new school, and she got to meet her kindergarten teacher. I was a little nervous as this was a much different setting than the preschool. But it didn't take long to realize how excited everyone there was to see Grace. We got stopped in the hall by everyone we met. They all stopped to talk to Grace and tell her how excited they were she was coming in the fall. It's a pretty neat feeling to be the mom of the coolest kid in the school. 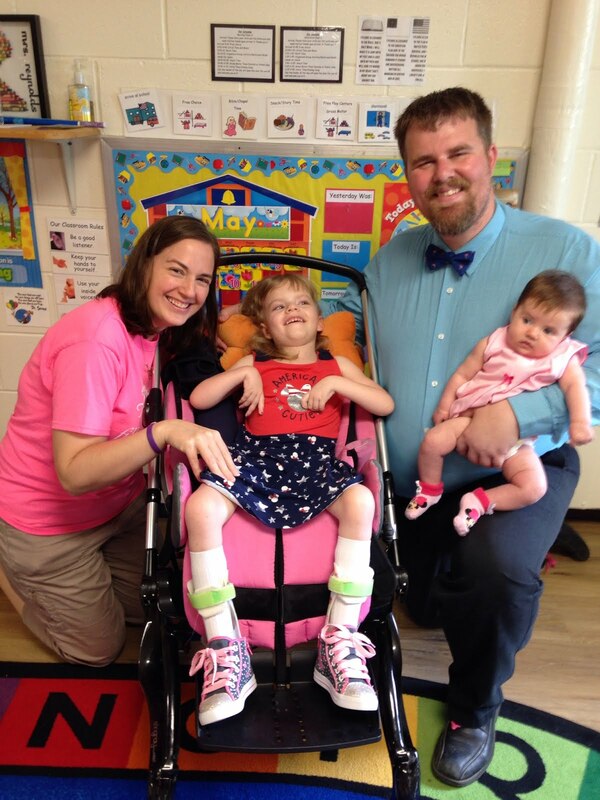 And I know the staff at Beckemeyer will take just as good care of Grace as at her preschool. I can't wait to walk her to school on the first day! 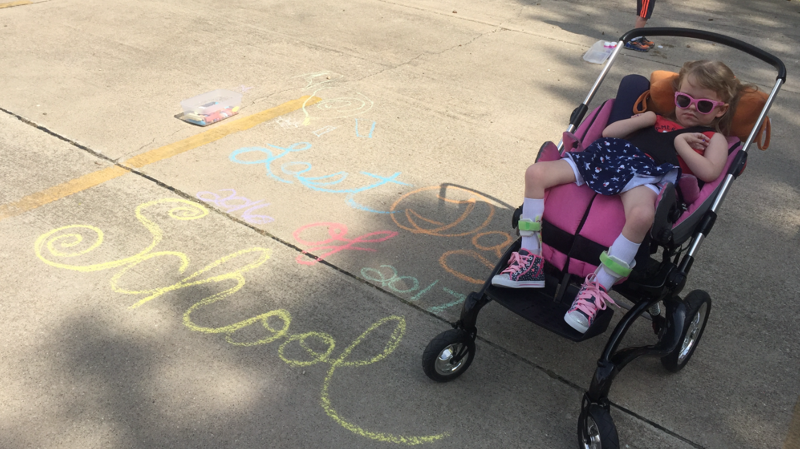 It may be the end of Grace's preschool days, but we will cherish the memories. From the zoo field trips to the Thanksgiving program with thankful soup, we have enjoyed every minute celebrating Grace's successes with her friends. And for that, we will always be grateful. After finishing preschool, Grace got to meet her new kindergarten teacher, Mrs. Paden! Next stop . . . kindergarten!